The RAS-mc is the only right angle slitter that effectively combines high speed productivity with product size flexibility. Quick change rotary tooling cassettes allow multiple product sizes and formats to be slit. Using Auto Adjust cassettes, product size changeover can be completed in as little as five seconds. The RAS-mc can product various flat card formats at speeds up to 6,000 sheets per hour. The RAS-mc is ideal for customers who produce direct mail cards in various sizes. The RAS-mc Right Angle Slitter can run 20-up business card formats at speeds up to 6,000 sheets per hour. When running business cards, an optional delivery conveyor with full length partitions is recommended. Switching between the general-purpose delivery conveyor and the business card conveyor takes less than a minute and does not require tools. 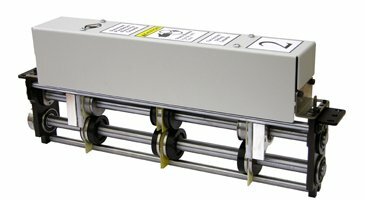 Using a delivery conveyor, with full length partitions, when running business cards, dramatically increases product collection efficiency and reduces operator workload. The RAS-mc can slit and score products at speeds up to 6,000 sheets per hour. Fix and auto adjust cassettes can be configured with combinations of rotary slitting and scoring tooling. The RAS-mc Right Angle Slitter has been designed to run common digitally printed sheet sizes up to 14” x 20”. As a result, the machine footprint has been optimized. The ability to quickly change between various product sizes and formats, eliminates the need for multiple competitive right angle slitters with each machine set up to run a single product size. The RAS-mc controls are integrated to improve efficiency and reduce operator workload. Starting/stopping, dual emergency stop and double feed detect/interrupt are integrated on the main and right angle sections of the RAS-mc. Main, right angle, delivery conveyor and auto adjust cassette controls are easily accessible and intuitive. The RAS-mc uses an offset style suction feeder. Features include; 13.5” paper pile capacity, “Big Foot” suckers, “express” down paper tray, pile height level detect/adjust, sheet separation blower control and double sheet detect/interrupt. RAS-mc uses a centerline paper path in the main and right angle section of the machine. Running paper to the centerline dramatically simplifies set up when switching between various sheet and finished product sizes. The RAS-mc uses a full-length alignment table on the main section of the machine. The alignment table accurately registers sheets to a guide edge before the sheet advances into the slitting head. The side registration can be adjusted to accurately position the sheet and to eliminate skew. The paper alignment system on the right angle section of the RAS-mc is unique. This “hybrid” alignment system uses a traditional angled roller section to transition the paper path from the main section. The angled roller section than advances the slit segments into a diagonal tape belt alignment section. The hybrid registration system provides better control and registration accuracy, compared to the traditional registration system using angled rollers only, especially when registering business card strips and similar demanding size products. The RAS-mc Right Angle Slitter is the only right angle slitter that has been design to run multiple product sizes and formats. Using quick change cassettes, with blade spacing pre-configured for specific product sizes, operators can change cassettes, without tools, is less than two minutes. Adding the Auto Adjust Cassette option further improves product size flexibility by eliminating the need for a dedicated, fixed size slitting cassette for each product. 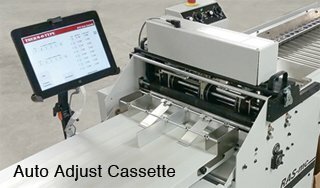 Using Auto Adjust cassettes, a wide range of product sizes can be accurately slit without the operator manually positioning blades or exchanging cassettes. The Auto Adjust option can also dramatically reduce the costs associated with purchasing multiple fixed size blade cassettes. The combination of the RAS-mc and Auto Adjust cassette technologies make the RAS-mc the most versatile right angle slitter available. The RAS-mc uses heavy duty, gutter cut slitting blades. Gutter cut slitting blades are ideal for finishing products printed multi-up with bleeds. Slitting blades are spring loaded to ensure a controlled amount of contact pressure between the cutting edges of the blades. THERM-O-TYPE gutter cut slitting blade assemblies have been well proven, with over thirty years of use, to be exceptionally effective and durable. The RAS-mc uses a long delivery conveyor with variable speed control. The delivery conveyor allows non-stop product collection and the ability to collect and separate individual orders as they are processed. The delivery conveyor is a standard feature on the RAS-mc and increases productivity while reducing operator workload. The RAS-mc Right Angle Slitter can be equipped with an optional system designed to batch variable quantity orders on the delivery conveyor. Batching orders on the delivery conveyor reduces product collection and separation errors, speeds product collection and reduces operator workload. Feeder Capacity 13.5" 13.5" 3.9" 5.9"
The RAS-mc produces 20x the work compared to the DC-615. The RAS-mc produces over 11x the work compared to the DC-645. The RAS-mc produces over 2.6x the work compared to the DC-745. 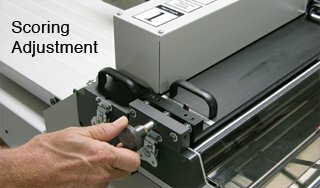 The Zip-A3E Pro is a cutter/slitter. Speed test were run with auto adjust cassette and lead/tail waste eject. Lower feeder capacity reduces productivity and requires more down time to reload the feeder. The RAS-mc/+ and the Zip-A3E Pro are the only machine, shown in this comparison, with a delivery conveyor as standard equipment. The delivery conveyor allows for product collection without the need to stop the machine and is a superior delivery compared to a bin type delivery which is standard on the DC-615, DC-645 and DC-745.